The story of Coach Farm begins with handbags- the world famous Coach handbags to be precise. During the 1960's and 70's Miles and Lillian Cahn built and managed Coach Leatherware. When their business became successful, the couple bought a farmhouse in upstate New York as a weekend getaway. But soon all that fresh air went to their heads and the Cahns grew determined to turn their getaway into a productive farm. While they tried to run the Leatherware works and the goat farm simultaneously, the couple soon realized that they would have to make a choice; the farm won out. It took some time to build the business because, in the 1980's when Coach Farm was just getting started, locally produced goat cheese had not yet been introduced to New York City! Today the farm has over 900 French Alpine dairy goats. Coach Farm has bred some of the best milk-producing goats in the world and even ships breeding stock all over the world. The cheese-making is done like it was in Old World France, with a hand ladle. The process is equal parts art and science. 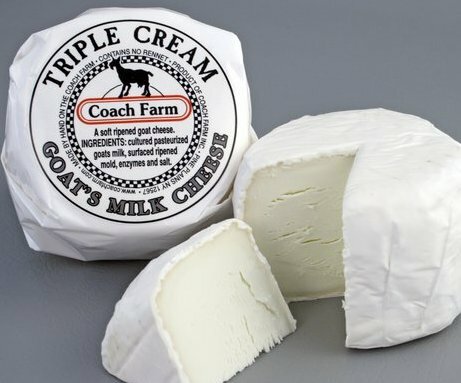 Coach Farm has managed to create artisanal goat cheeses that were once found only in the remote villages of France by combining modern methods with old-fashioned cheese-making techniques.